Long ago pilgrims would travel great distances to visit a holy spring, or to drink from a sacred well. Like an image out of a fairy tale, we don’t give much thought to springs nowadays. Water runs from our taps or we drink from from the bottled ‘spring’ water’ available in the shops. Our hands have forgotten how it feels to dip into clear sweet tasting water. How often do we kneel on mossy banks to gaze at our reflection mirrored on the surface of a glistening pool of water. There has to be clean water in the mind for the spirit to drink. Recently I accompanied a small group of meditation teachers from various traditions on a pilgrimage of Kyushu island in Japan. Kyushu still has wild parts. Looking out from the window of the mini van one could easily fantasize the form of a lone samurai emerging from the misty pine groves we passed or imagine farmers clad in indigo working in the rice fields along the road. It was hard to take one’s eyes off the scenery. We were easily absorbed by the intense color of the ripening grain and the painting of clouds and turquoise sky reflected off the the paddies. The region was mountainous and water dripped off the cliffs. Escaping through rocks, it flowed and rushed down woodsy ravines to the roads that followed the curves and shapes of the landscape. Lush and green, this was a volcanic island and water was bubbling everywhere. Here, it was easy to accept that nature had been revered by the ancient Shinto tradition of Japan for more than three thousand years. One of our stops was to be a sacred fountainhead, a hidden spring in the forest, off a main street of a small Japanese village. Before our group arrived at the spring we had become accustomed to beauty. We paid homage at a Buddhist temple and Shinto shrine. We had seen farmsteads, look out points, walked a forest trail, delighted in a cave of thousands of tiny balanced rock cairns. 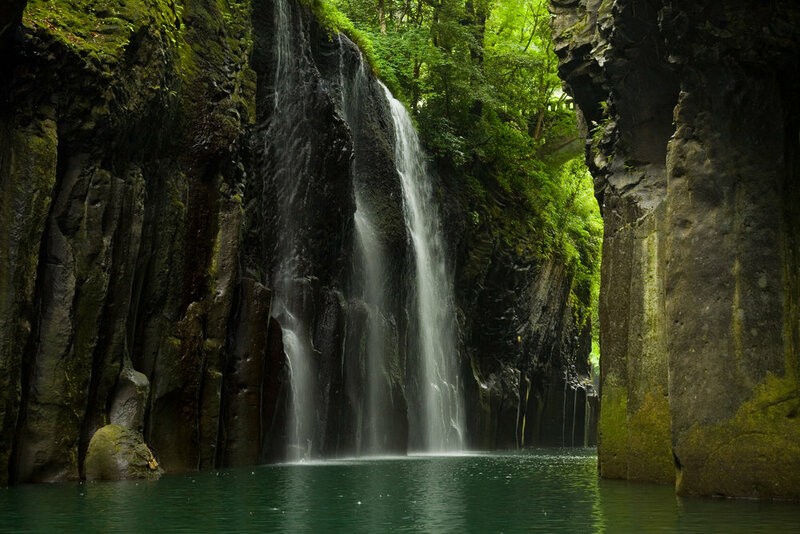 We had stood at the edge of the famous Takachiho gorge, looking down upon a luminous river of liquid aquamarine, silently meandering between rugged cliff sides. None of these experiences, however, prepared us for the moment we knelt along the soft green bank of the Shirakawa water spring. Nestled in a pine grove this bewitching pond was difficult to see at first as it reflected the pine trees around it. Like looking into a polished mirror, it confused our eyes. The trees around the pool stood as guardians with a loving protective gaze lest we intruders did not recognize the sanctity of what we were being shown. This was a nature temple and it was holy. The water was alive and the fragrant herbs and moss knew they were blessed to also drink from this secret wonder. The water was not very deep and as one focused carefully looking closer one could see the tiny bubbles of water escaping the earth’s core through the sandy bottom. Under the smooth surface emerald like plants swayed in this crystal bath. Experienced travelers such as our group had never seen such clear water. Like children, hushed we stood, with eyes wide as though we had seen a unicorn step through the trees.